Samsara has been released on Blu-ray and DVD in the USA, and will be released in the UK and other countries on the 14th January 2013. By now from Amazon using the links below. Using the links below gives a small kick-back to SpiritOfBaraka, which helps with the cost of running this website. 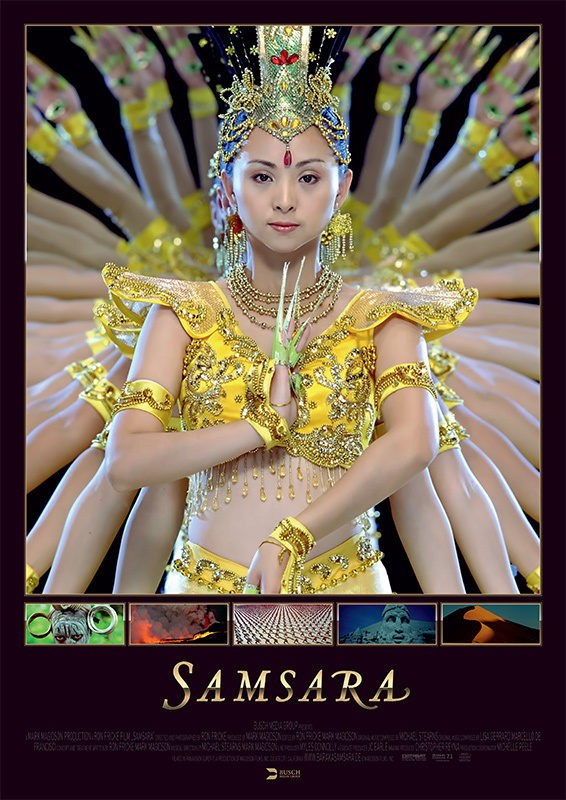 Samsara is being released on Blu-ray, DVD, and CD soundtrack on 8th January 2013 in the USA and 14th January 2013 in the UK. To celebrate we are giving away 5 Blu-rays, 5 CD Soundtracks and 5 Baseball caps. To enter the competition simply leave a comment below telling us about your experiences with Samsara or Baraka. Don't forget to leave your email address in the email field. Your email address is not visible or shared with others. 5 winners will be selected at random, each winning a Blu-ray. 10 runners up will be selected at random, each winning a CD Soundtrack or Baseball cap. The competition will close on Monday 14th January 2013 at 5pm GMT. The winners will be posted here, and informed via email. You can also pre-order from Amazon using the links below. Using the links below gives a small kick-back to SpiritOfBaraka, which helps with the cost of running this website. 2012 is the 20th Anniversary of Baraka. 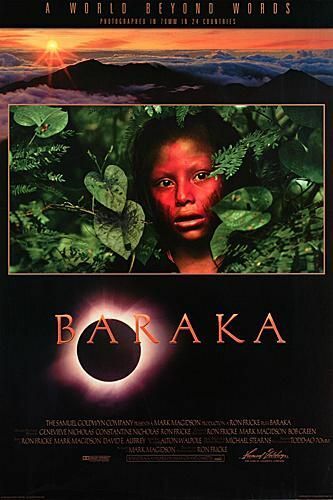 We're interested in hearing from anyone who has any photographs of memorabilia, lobby tickets or anything related to the original release of Baraka in 1992. We're also interested in hearing about any stories you have about Baraka from the original release in 1992. Ron Fricke and Mark Magidson give wonderful insight into the theme behind Samsara, and the contrasts to Baraka. SAMSARA The Concept from Baraka & Samsara on Vimeo. The Samsara team have made a lovely film about the creative process of the film's soundtrack. SAMSARA The Musical Journey from Baraka & Samsara on Vimeo. Here is the German poster for Samsara. Release will be at 23th of August in Germany. Richard Sidey has kindly released his film Landscapes at the World's Ends, in full, for us all to watch. You can watch it on the film page. Richard Sidey's Landscapes At The World's Ends is available for a limited time on DVD. Sergio San Martin is seeking a musician to score a non-verbal documentary.
" I am seeking an original composer to create an original score for a short film project. The film was filming in Vietnam in 2009 and it is about transports and cycles. The film is very close to "Dogora". " Sergio has complete a recent documentary. "El Buste", a 10 min documentary speech less shooted in the rural region of Tarazona (Spain). It won Best etnographic documentary in "Festival de Cine Social de Valparaiso, Chile, 2008, selected in Ambulart 09, selected in Brianza Film Corto edizione 2008 and selected in “Lessinia Film Festival 2009". Crossing Worlds is an interesting project using spherical photography. The film is inspired by Baraka and the other films in this genre. 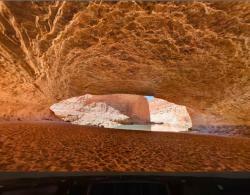 With stunning photography of various landscapes, the special spherical player allows one to change the viewing angle. Take a look. 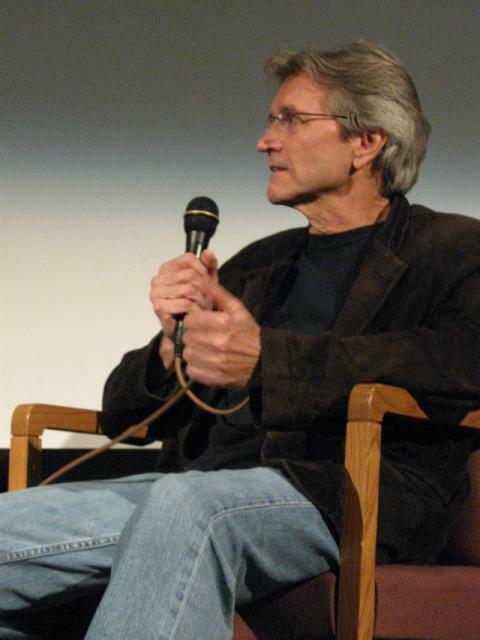 Tom Lowe has changed the title of his forthcoming film from "Southwest Light" to "TimeScapes." Expect something fantastic from Tom. This trailer shows the quality of Tom's work. Update: Tom is currently with Godfrey Reggio on a new film called Once Within a Time. Tip: Watch this film in HD and in full-screen. Amazing quality. TimeScapes: Rapture from Tom Lowe @ Timescapes on Vimeo. LIGHTSCAPES is an episodic, half-hour experiential television series airing on Discovery HD Theater that captures famous buildings and landscapes around the world as they are transformed by stunning, large-scale lighting displays. Captured in stunning 4K HD with both real-time and time-lapse cinematography, the unique Lightscapes visuals are accompanied by an instrumental soundtrack, drawing inspiration from the highly acclaimed feature film Baraka and the HD Theater television series, Sunrise Earth. LIGHTSCAPES premieres on Discovery HD Theater June 21 at 7:30 AM ET following a half-hour edition of Sunrise Earth, with a repeat at 10:30AM EST. Grant Wakefield has 3 new short films to check out. REMNANTS explores the rise and fall of the Megalithic civilisation of Britain, via highly stylised, motion controlled digital timelapse cinematography, set to an original score by members of Tangerine Dream. Tom Lowe has a new clip from his forthcoming film Southwest Light. The clips is short, but the imagery looks great. 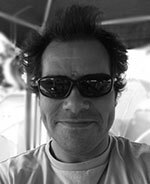 Tom says: "I am planning to wrap principle photography on Southwest Light next March, and will edit the film in New Zealand in Spring/Summer 2011." The Samsara production team suggest that Samsara will be released in 2011. 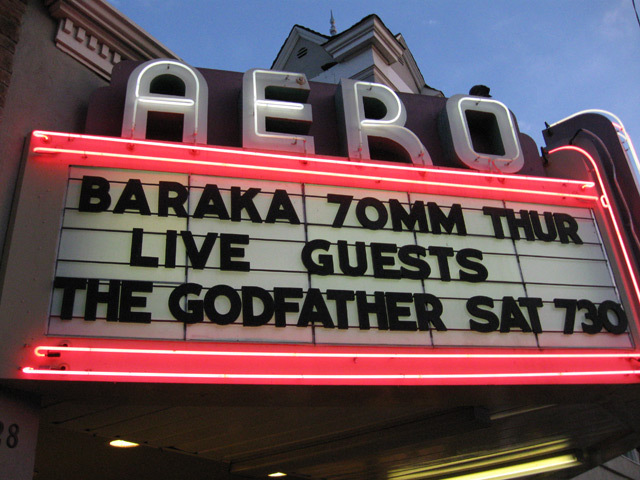 Pierre André has kindly provided photographs from the Baraka showing at the Aero Theatre in Santa Monica, California. 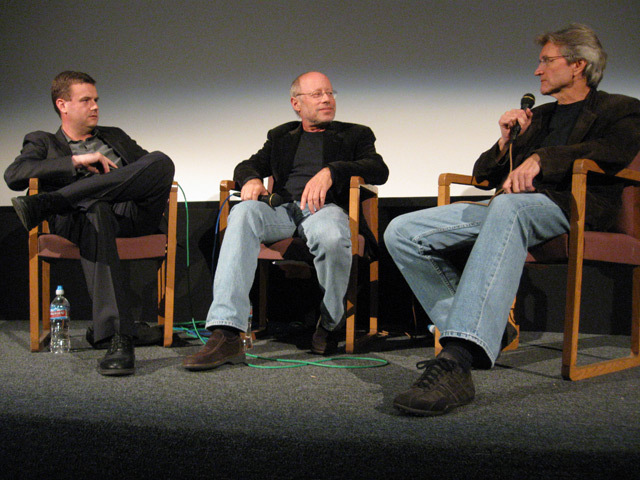 Ron Fricke and Mark Magidson were in attendance and answered questions about Baraka and Samsara. 70mm Baraka showing, April 22nd, Aero Theatre in Santa Monica, California. Fricke and Magidson in attendance. Baraka is being shown on April 22nd at the Aero Theatre in Santa Monica. The screening is in 70mm. Both Fricke and Magidson will be there to discuss. 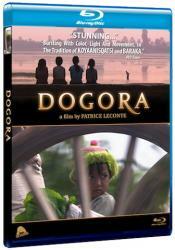 Dogora, Patrice Leconte's wonderful insight of the people of Cambodia will be released in April. The DVD will also be re-released at the same time. The film will be a mixture of timelapse, slow-motion, and real-time footage. Tom will travel the American Southwest (California, Nevada, Utah, Arizona & New Mexico) for ten straight months, no stopping. Tom says: "My goal is to create a portrait of “a time and a place” using poetic, haunting, jaw-dropping visuals. 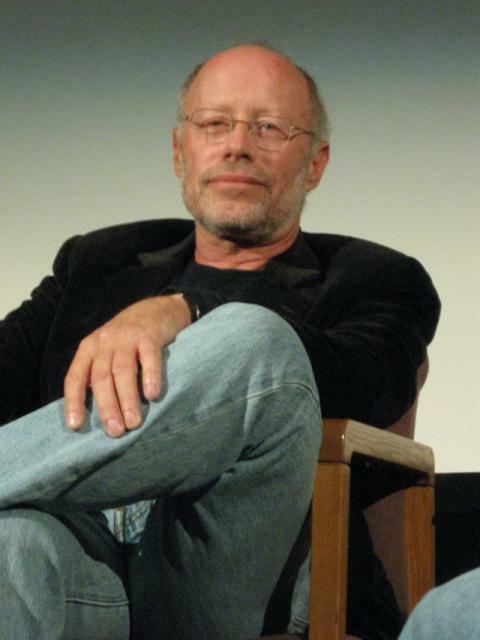 The genre of the film will be similar to non-narrative masterpieces Baraka and Koyaanisqatsi." Tom has received financial backing and plans to start shooting in Feb 2010.